I am 100% sure that Michigan Avenue is what Heaven will be like. Except the stores won't require any money. SERIOUSLY. Have you been to the Magnificent Mile?! The window displays are enough to make you drool. This one is important. WHY is all pizza not Chicago style? 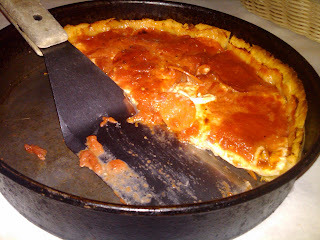 This was my first experience with Chicago-style pizza, and to say that I couldn't get enough is an understatement. I'm sure I have more words of wisdom, but I'm too excited to get to the pictures, so here we go! Sit tight, it's gonna be a long one, folks. I thought about having Dan take a photo of me enjoying my pizza, but I was too busy scarfing. Yum. We finished up the boat tour in the early afternoon, and after a break to rest my feet (and get some cookies and milk at the Corner Bakery), we decided to do a little shopping. If you read my recent post on shopping for maternity clothes, you'll know that Raleigh's store selections left a lot to be desired. The stores on Michigan Avenue were so much bigger in general that I had higher hopes. Long story short, H&M and Zara were disappointing, but we hit the mother load at GAP - and they were having a sale. Double score for us. I didn't get too awfully much - just some basic staples (short-sleeve and long-sleeve shirts for layering and a few light weight sweaters), but we got a great deal on all of it. We were actually in search of a jacket, but we didn't find one we liked. A new store called Top Shop had just opened, and quite a few people recommended that we try there, but we didn't end up going because (1) we walked approximately 29384729374 miles that day and I didn't pack appropriate shoes, so my feet were swollen and my back was killing me, and (2) it looked a little trendy for me. Maybe next time! After our shopping trip, it was nap time due to aforementioned sore and swollen feet and back. Per Ana's suggestion, we tried out Eleven City Diner for dinner, and it did not disappoint. Finally, on our way home we dropped by the Observatory on the 96th floor of the John Hancock building to see the city all lit up at night. To say it was beautiful would be an understatement, but next time we go I think I'll take Nina's advice and go to watch the sunset. Why hello, baby bump. Where did you come from? It took a few shots to get this close to perfect, but it made me laugh nonetheless! They still fill in the scores, etc. by hand. So cool! Your eyes are not, in fact, deceiving you. That is a head sized helmet FULL of nachos. The good news is, we made a pretty good dent (I'm undecided as to whether that fact should be embarrassing or impressive) - we for sure got our $15 worth. The bad news is, there was no room left for a delicious hot dog. Oh well! Recognize the singer of the 7th inning stretch? He threw out the first pitch, too. #Winning. Friday night, we met Katie for dinner at Old Jerusalem, and it was delicious. The hummus was divine, and I thoroughly enjoyed my chicken kabob as well. Cool little place, Old Jerusalem is. We went to bed early again because I was pooped from all of the activity. On Saturday, Katie took us to St. Charles to visit Aunt Shelley and Uncle Mike for the rest of the weekend. We were so glad that we got to spend a few days with them to catch up, and they spoiled me rotten the entire time! Also, their home is breathtaking. It is straight out of Better Homes & Gardens - it is so beautiful! The rest of our weekend in St. Charles was very relaxing and low-key. We ate a lot, went to church, napped, watched some football, went to a movie, ate some more, sat outside by the fire, ate even more, and just relaxed. Here are a few pictures of us with Aunt Shelley, Uncle Mike, Katie, and sweet Logan whom Layla would have LOVED (FYI, it has been brought to my attention that I am doing the "pregnant woman pose" in all of the following pictures. Was trying to get good shots of the bump for the Grandparents to see since I was wearing a flowy shirt!). Weibles, if you're reading, thank you so much for your hospitality. We had an amazing weekend spending time with you and can't wait to see you again soon! Well friends, I may have just broken my own record for the longest post in the history of the blog, but I hope you enjoyed reading as much as I enjoyed reminiscing. The trip to Chicago was so wonderful, and I can't wait to visit again soon. Hi Sarah and Dan, My first time on your blog. I am very impressed. Sarah, you make me want to go to Chicago and see all the sights, eat, shop and eat again. Your next trip will be with Baby Boy Baum and we will do completely different things and show you more of Chicago.